Sorts data records between header, trailer records in a data set and copies to an output data set. Copies one or more header records and/or one or more trailer records to the output data set in their original input record order. while sorting the input dataset data records between the header and trailer records to the output data set. Thus, the first n records (header records) and/or last n records (trailer records) are kept in place and the data records between them are sorted. DFSORT SORT statement must supplied in xxxxCNTL to indicate the control fields for sorting the data records. The DFSORT control statements are used in xxxxCNTL if USING(xxxx) is specified. Specifies the input data set ddname. 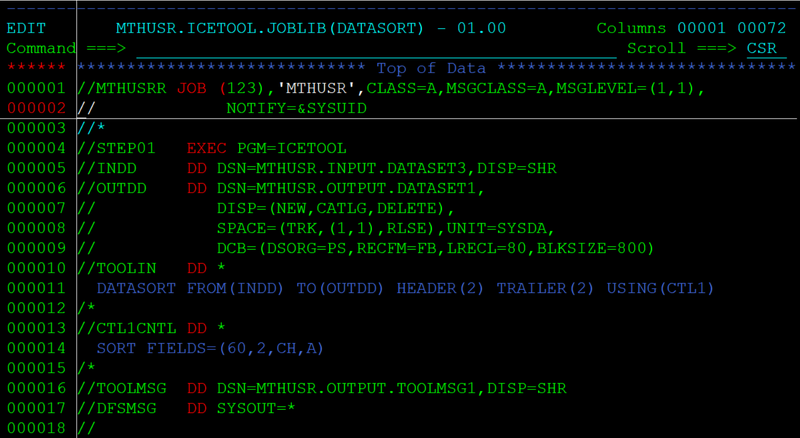 Specifies the output data set ddname for the sorted records. DD statement must supply for the ddname specified. DD statement must supply for xxxxCNTL if USING(xxxx) specified. TO, USING or TO and USING must be specified. Defines the number of header records (first u records) and/or trailer records (last v records) to be kept in place. u and v must be specified as n or +n where n can be 1 to 1000000. Below example to sort the employee data records(kept the header and footer as it is) based on the country code(from 60th position of length 2) to output dataset. INDD	- Specifies the ddname for input dataset. OUTDD	- Specifies the ddname for output dataset. DATASORT FROM(INDD) TO(OUTDD) HEADER(2) TRAILER(2) USING(CTL1)	- Sorts the data from INDD based on the USING condition specified in CTL1 ignoring 2 header and 2 trailer records. SORT FIELDS=(60,2,CH,A) – DFSORT condition in CTL1 to sort the records from 60th position of 2 length.